Heat oven to 375°F. Spray bottom and sides of 8-inch square pan with cooking spray. In medium bowl, mix brown sugar, 1/3 cup flour blend and the cinnamon. Cut in cold butter, using pastry blender or fork, until mixture is crumbly. Set aside. In large bowl, beat 3/4 cup granulated sugar and the softened butter with electric mixer on medium speed until fluffy. Beat in eggs until blended. Beat in 1/2 cup milk and 1 1/2 teaspoons vanilla just until blended. Stir in 1 2/3 cups flour blend, the baking powder and salt. Spread half of batter in pan. Sprinkle about 3/4 cup streusel mixture over batter. Drop remaining batter over streusel; spread carefully. Sprinkle remaining streusel over batter. Bake 30 to 35 minutes or until toothpick inserted in center of cake comes out clean. Cool at least 30 minutes. In small bowl, mix Glaze ingredients until smooth and thin enough to drizzle. Drizzle over warm coffee cake. Serve warm. 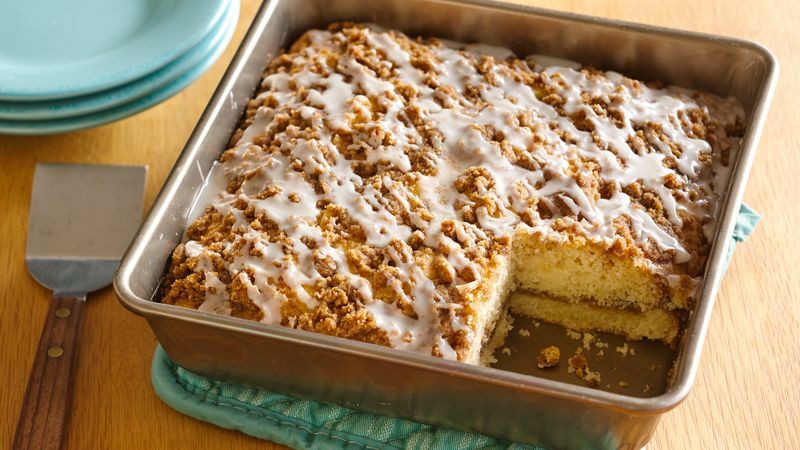 Warm coffee cake is one of life's pleasures, but be sure to cool this one at least 30 minutes to let it set and be easier to cut and serve. Store cooled coffee cake covered at room temperature up to 2 days.